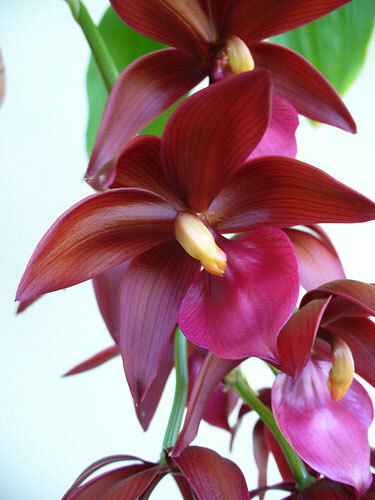 Mormodes orchids, sometimes called "Goblin Orchids", are relatives of Catasetum. The flowers are asymmetrical, with the lip twisted to the side; breeders try to minimize this, but it's an inherent characteristic of the genus (and I find it interesting). Like related genera, these epiphytes have large, thick pseudobulbs covered with a bract of dead leaves, and with a fan of leaves distributed along their length. Not long after flowering, the plants drop their leaves in preparation for a dry season, and should not be watered until growth resumes unless the pseudobulbs shrivel a lot. This cross is a popular intergeneric hybrid with Cycnoches. This plant is highly awarded, partly because its flowers are so symmetrical.